The Locks 4 Vans Ultimate Lock is just that! We are living in tough times at the moment and van break ins are rife across the UK and beyond. The criminals are willing to risk more and more to steel your hard earned tools or secure freight and so you need to take your vehicle security more seriously now than ever before. 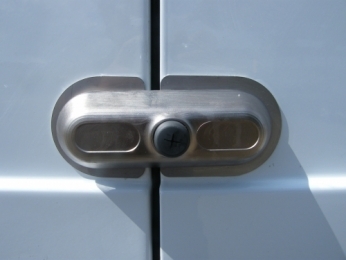 The Ultimate Van Lock is available as either a Slamlock or as a Deadlock and can be fitted to all doors of most current model vans. The key is a high security anti pick dimple type for maximum security and the body of the lock is one seriously tough bit of metal. Please see the video below for a demonstration and contact us for more information.